Europe’s ancient embrace of farming took the continent on a demographic roller-coaster ride. Regional booms and busts in human numbers occurred between 8,000 and 4,000 years ago, a new study finds. From southern France to Scotland and Scandinavia, 10 of 12 regions with early farming sites experienced substantial population ups, downs or both, say archaeologist Stephen Shennan of University College London and his colleagues. Known climate changes from the period show no relation to the timing of the shifts in the size of these farming societies, the researchers report October 1 in Nature Communications. “Diminishing natural resources due to agricultural practices may partly have caused population busts,” says anthropologist and study coauthor Sean Downey of the University of Maryland in College Park. He and his colleagues reported in 2012 that as Britain’s population increased following the introduction of farming, the nation’s forests shrank in size — consistent with a reduction in available wood and food products needed to sustain a large population. Researchers already knew that agriculture in Europe appeared in modern-day Turkey around 8,500 years ago, spreading to France by about 7,800 years ago and then to Britain, Ireland and Northern Europe approximately 6,000 years ago. Farming led to more plentiful, stable food supplies, fueling population growth. But little is known about long-term population trends among ancient European cultivators. 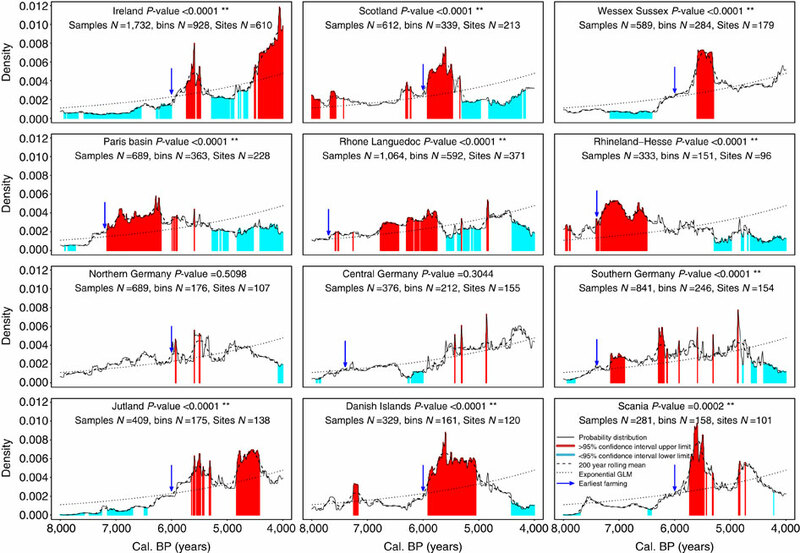 Shennan’s group used nearly 8,000 radiocarbon dates from archaeological sites across Western Europe to calculate rises and falls in numbers of sites before, during and after agriculture’s introduction. 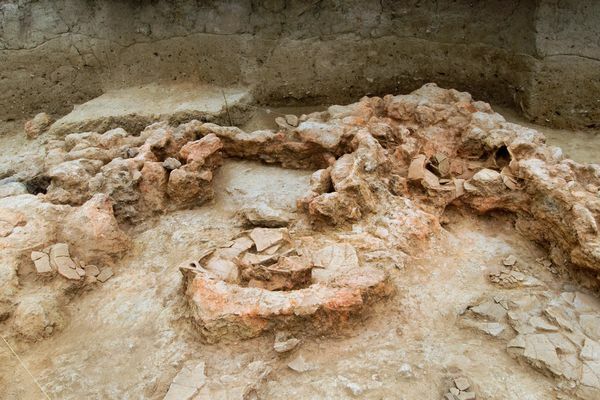 The researchers took fluctuations in the numbers of radiocarbon-dated sites as signs of population changes, reasoning that more archeological sites in a region at a particular time meant more people were living there. In most sections of Europe, populations at some point declined by as much as 30 to 60 percent compared with peaks achieved after farming began, Shennan’s team concludes. That population plummet is similar to the continental devastation wreaked by the Black Death, an epidemic that peaked in Europe between 1348 and 1350. The new results illuminate two major population booms in Europe that preceded declines, remarks archaeologist Ron Pinhasi of University College Dublin. An initial boom around 7,500 years ago marked the start and spread of Europe’s earliest-known farming culture, recognized by its distinctive lined pottery. A second boom around 6,000 years ago — perhaps driven by the rise of raising livestock for dairy products (SN: 2/1/03, p. 67) — occurred as farmers expanded into Northern Europe, Pinhasi says. Shennan’s team designed a valuable procedure for estimating ancient population fluctuations, says archaeologist Jean-Pierre Bocquet-Appel of the National Center for Scientific Research in Paris. But unlike Shennan’s team, Bocquet-Appel says that only three regions in the new analysis — Ireland, Scotland and southern France — display clear statistical evidence of population busts following booms.